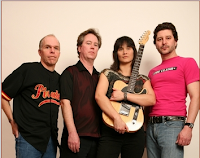 The Motor Primitives will be playing at The Main Stage in Waukesha, Wisconsin on December 1, 2007, 9 pm. That's this coming Saturday, for the calendarly challenged. The show is in celebration of the release of Dad The Plow's first CD. Also playing is Subatomic. Cover charge is only $5.00! For those of you who don't know Waukesha, it's about 65 miles east of Madison and 20 miles west of Milwaukee just off I-94. Let all your Milwaukee and Waukesha friends know! It should be a good time. I'll be singing along on great acoustic hits from the seventies. Too bad you can't be there. Bring them all along! Just promise you won't sing any of those songs.